Long Beach Poly, CA, lit up the track in the boys COA 4x800 with a US#3 All-Time clocking of 7:31.69! Anchor Myles Andrews split 1:49.54. (Photo by Don Rich). Dendy 50-8.25 Triple Jump (Photo by Don Rich). Ammar Moussa 14:05 at Stanford (Photo by Victah Sailer/PhotoRun). PHILADELPHIA, Pa. – As loud and crazy as Franklin Field, especially with 48,531 people packed in the stands, Long Beach Poly’s Aaron Harris felt some gratitude for making the place just a little more quiet. PHILADELPHIA, Pa. – Olicia Williams stood on the side and watched while Ajee Wilson of Neptune (N.J.) comfortably delivered one of the greatest relay legs ever seen by a high schooler at Penn Relays. The St. Anthony’s junior didn’t have any thoughts of trying to match it. And she didn’t need to. THE EXCITEMENT CONTINUES. CBA WINS COA DISTANCE MEDLEY / MORGAN PEARSON TAKES 3000M TO END THE DAY NICK VENA WINS HIS 4TH PENN SHOT PUT WITH A MEET RECORD 72-9.25!! DICKINSON KICKS THINGS OFF WITH COME FROM BEHIND WIN IN 4X8 PRELIM TO Q FROR COA RACE / VERSA ANCHORS IN 1:51.7 PENN RELAYS WEEKEND! COMING TO YOU FROM HISTORIC FRANKLIN FIELD / NJRUNNERS AND THE MILESPLIT NETWORK WILL BE BRINGING YOU BLANKET COVERAGE ALL THREE DAYS. 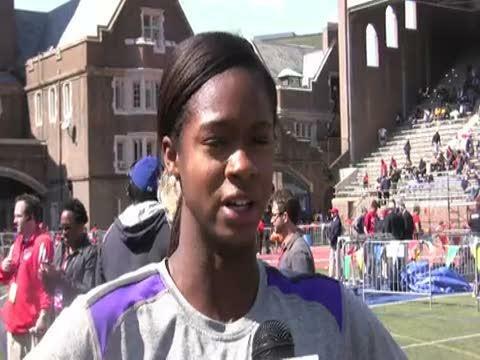 PHILADELPHIA, Pa. -- Louisiana State freshman Jasmin Stowers (Pendleton) won the 100-meter hurdles finals at The Penn Relays. 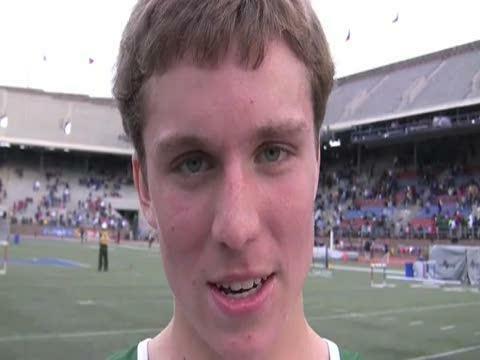 Fayetteville-Manlius won the Distance Medley Relay Championship of America at The Penn Relays Thursday in a meet record 11:34.46. F-M led a New York-contingent that owned the DMR. North Shore, carried by Brianna Nerud’s 3:31.7 leadoff and Samantha Nadel’s 4:45.84 anchor, finished second in 11:36.10. Cardozo, which had the day’s fastest 4x400 relay, finished fourth in 11:51.16. Aisling Cuffe remembered having an off-day whlle watching Haley Pierce turn in the best race of her career earn an upset at Penn Relays. 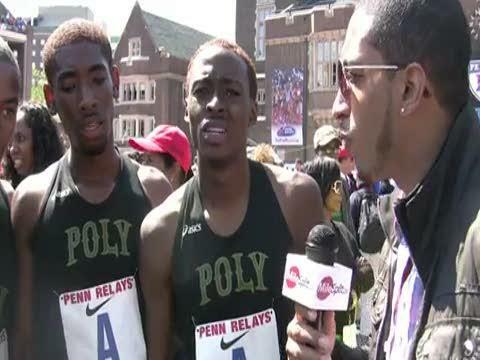 PHILADELPHIA, Pa. – The Cardozo runners said they didn’t have anything to prove at Penn Relays. They didn’t know how fast they could run. 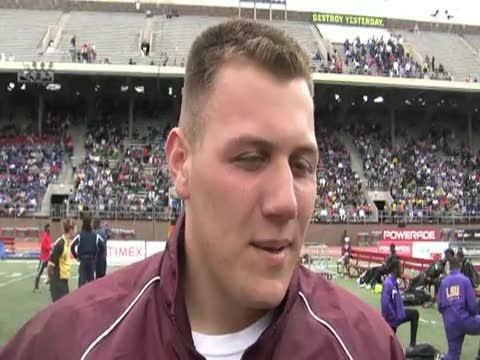 East Brunswick (N.J.) thrower Sam Mattis talks about his second place finish in the discus at Penn Relays. Dendy won the boys triple jump with a mark of 50-8.75 on the last jump of the finals. Ahtyana Johnson will never run another race for Benjamin Cardozo. But that doesn’t mean that she’ll never run another race. 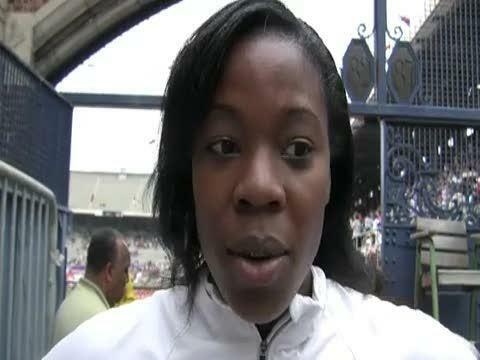 Louisiana State University freshman Jasmin Stowers talks about Penn Relays and winning the 100-meter hurdles. 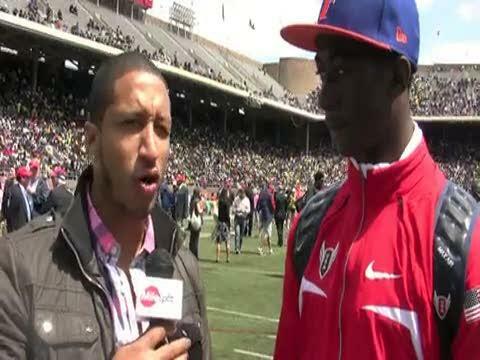 PHILADELPHIA, Pa. – When Jordan Yamoah finally got his chance to meet Bill Cosby at Penn Relays, he told the meet’s most revered celebrity that he had been dying to meet him. “Well, I’m glad you lived,” Cosby told him. Serra put up a great effort in the boys COA 4x400 and finished 2nd with a time of 3:14.39. US#8 All-Time 4x800 Central Bucks West in taking 3rd in 7:38.97. 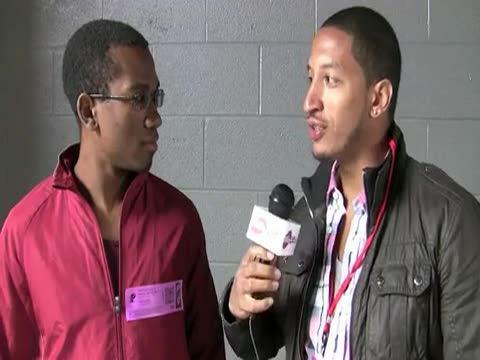 Benjamin Cardozo's Chamique Francis talks with ArmoryTrack's Christopher Hunt. 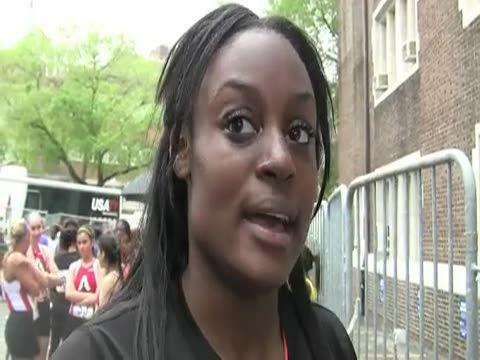 Homer Center's Angel Piccirillo talks about winning her second mile at Penn Relays. 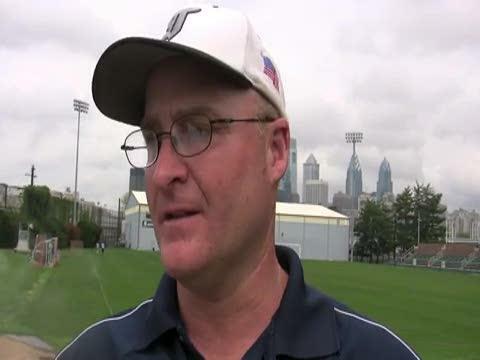 Tamaqua throws coach John Kotchmar talks about throws at the school. Fayetteville-Manlius won the Distance Medley Relay Championship of America at Penn Relays Thursday in a meet record 11:34.46. F-M led a New York-contingent that owned the DMR. North Shore, carried by Brianna Nerud’s 3:31.7. PHILADELPHIA, Pa. – St. Anthony’s didn’t get quite what they came for but the Friars certainly did not leave empty-handed. 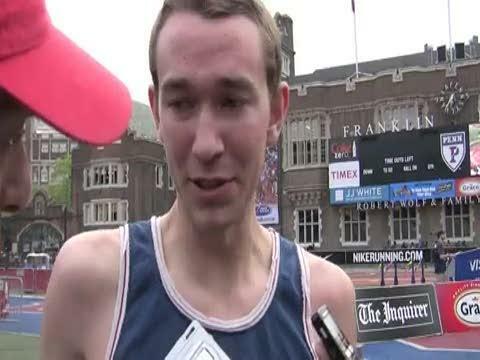 St. Anthony girls talk about making today's 4x800-meter relay event at Penn Relays. Fayetteville-Manlius girls DMR team talks about the win and new meet record. Tatnall (Del.) coach Pat Castagno talks about Haley Pierce and the team. Christine Streisel talks about javelin and her second place finish. Tatnall's (Del.) 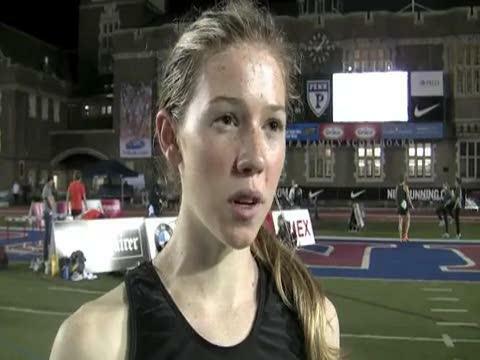 Haley Pierce talks about winning the Championship 3,000-meter run at Penn Relays. 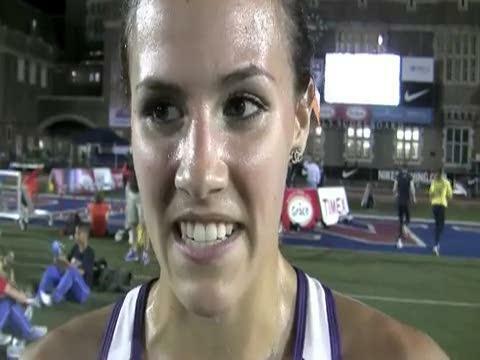 Clemson junior Alyssa Kulik (Mauldin, S.C.) talks about winning the steeplechase Thursday night. 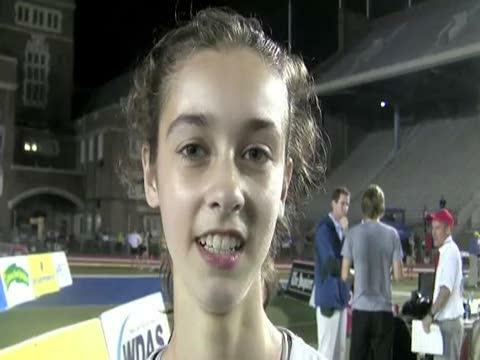 Notre Dame Academy's Maria Seykora talks about setting a new personal best in the mile. Gambrell finished 2nd in the boys long jump with a leap of 50-0.75. 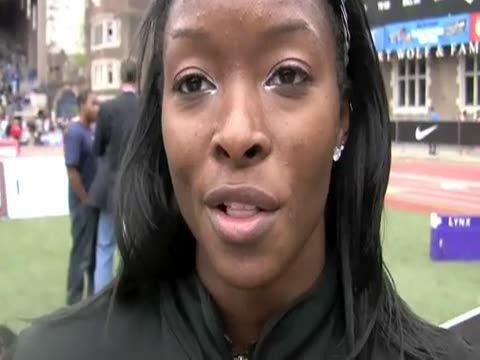 Medgar Evers will have Sandrae Farquharson available for the rounds of the 4x400 relay at Penn Relays this weekend. The problem for the indoor national champs, is that they likely will not have Kadecia Baird. Strath Haven PA qualified for their first-ever COA in the 4x800 with their 9:09.62, 2nd best US on the day. 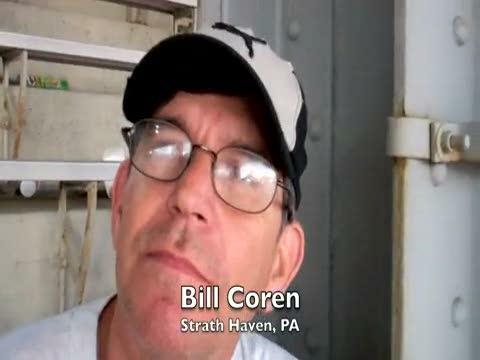 Coach Bill Coren discusses the race. With spring and the imminent hope for warm weather comes many things such as horse racing, spring football, picnics, biking adventures and much more but for me it means one thing, Penn Relays. 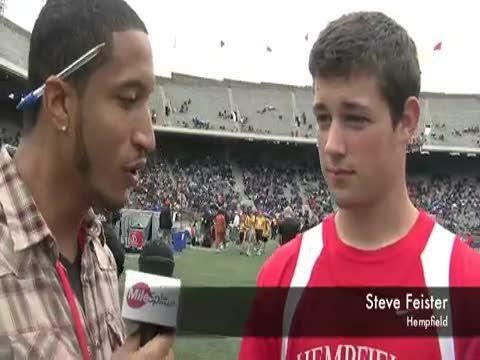 The Penn Relays Carnival is one of the oldest and longest running (no pun intended) events in the sporting world. For someone who loves track and field The Relays, as they are colloquially known, represent the Mecca of the track and field world representing everything that is great and pure about the sport. The 2011 Penn Relays had three all-time great performances from Virginia in the relays from the Western Branch girls 4x100, Bethel girls 4x400, and Hidden Valley girls DMR as they joined a short list of teams to ever break 46 seconds in the 4x100 (Western Branch 45.97), 3:50 in the 4x400 (Bethel 3:48.10), and 12 minutes in the DMR (Hidden Valley 11:46.93). Annie LeHardy ran anchor leg for Hidden Valley's DMR, which finished 3rd behind national powerhouse Fayetteville-Manlius of New York. 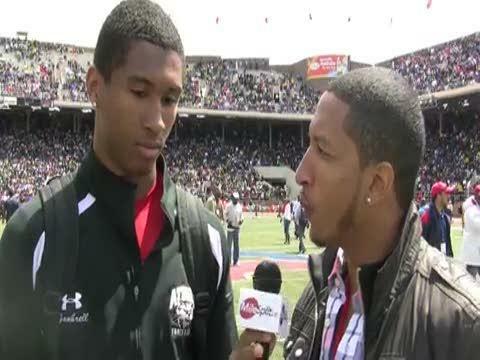 (Photo by Maroon News) A quick review of some of the top performers from Virginia at the Penn Relays. VA Top Performers at Penn Relays Girls Pole Vault - 1. Cameron Overstreet (Atlee) 12-5.50 COA Girls 4x100 Finals - 4. Western Branch 45.97 COA Girls Distance Medley Relay - 3. Hidden Valley 11:46.93 Boys High Jump - 2. Joey Muzzio (James Robinson) 6-7.75 Boys Pole Vault - 3. Chris Pillow (Atlee) 15-9 Boys Mile - 4. Kyle King (Grafton) 4:12.16, 5. Jeremy Greenwald (Grassfield) 4:14.65,. Small School Girls 4x100 Finals - 5. Phoebus 47.68 Boys 3K - 4. Silas Frantz (Douglas Freeman) 8:30.39, 13. Adam Visokay (Albemarle) 8:35.26,. Girls 3K - 6. Krista Deceault (Sherando) 9:43.68, 11. Hannah Lowery (Stafford) 10:02.15 Boys 400 Hurdles - 5. Anthony Williams (Potomac) 54.37 Large School Girls 4x100 Trials - 4. Western Branch 46.49, 24. Landstown 49.18, 25. Osbourn Park 49.23. Small School Girls 4x100 Trials - 9. Phoebus 48.27. Girls 4x400 Trials - 8. Bethel 3:48.10, 15. Western Branch - 3:52.78, 24. Osbourn Park - 3:57.14, 25. Phoebus - 3:57.32, 26. 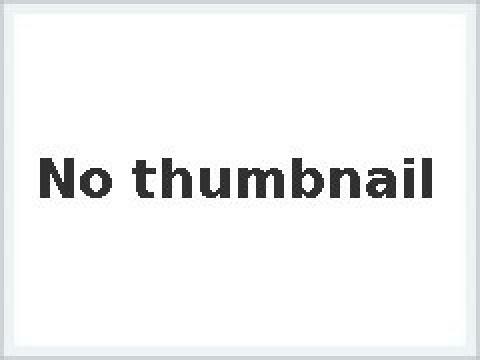 Battlefield 3:57.39, 30. Thomas Edison 3:58.47, 34. Landstown 3:48.93, 42. St. Catherine's 3:59.70. Boys 4x400 Trials - 31. Annandale 3:22.82, 36. Western Branch 3:22.82, 39. Woodbridge 3:23.10. Boys Triple Jump - 5. Sean Price (South Lakes) 47-3.25, 8. Marcus Dean (Western Branch) 46-10.75 Girls Triple Jump - 5. Desmonae Gray (Western Branch) 38-6.75 Boys Shot - 4. Isaiah Simmons (Woodbridge) 63-2.75 Girls Discus - 7. Daquaa Scott (Robert E. Lee) 127-9. Girls 4x800 Trials - 13. West Potomac 9:21.84, 16. Lake Braddock 9:23.86, 20. Battlefield 9:27.35, 29. Osbourn Park 9:33.44. Girls 400 Hurdles - 13. Vammonie Boddie (Phoebus) 1:04.27 Boys 4x100 Trials - 17. Western Branch 42.59, 66. Grassfield 43.61, 83. South Lakes 43.82 Boys 4x800 Trials - 13. Mountain View 7:56.27, 29. Tallwood 8:03.04. 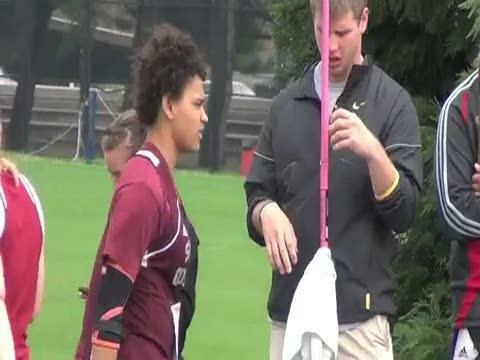 PHILADELPHIA, Pa. -- Seneca graduate LaKya Brookins, a senior at University of South Carolina, talks about the sport and her future in it. A list of Virginia teams and relays competing at this week's Penn Relays. This year's Penn Relays certainly expects to produce some of the fastest times this spring from Virginia's best relays while big names will star in the individual events including Isaiah Simmons, Keilah Tyson, Cameron Overstreet, Cody Snyder, Desmonae Gray, Jeremy Greenwald, Kyle King, Chris Pillow, Krista DeCeault, Anthony Williams, Silas Frantz, Anaquan Peterson, and Hannah Lowery. Relays to pay particular attention to are the Western Branch girls 4x100 and 4x400, Hidden Valley girls DMR, and potential for several boys relays to stake their mid-season claims as Virginia's best relays in the 4x100, 4x400, and 4x800. Long Beach Poly finished 2nd in the 4x800 with a time of 8:59.72 behind Edwin Allen JAM, 8:39.22. Central Bucks South finished 2nd in the COA DMR with a time of 10:15.46. Steve won the javelin with a toss of 211-5. 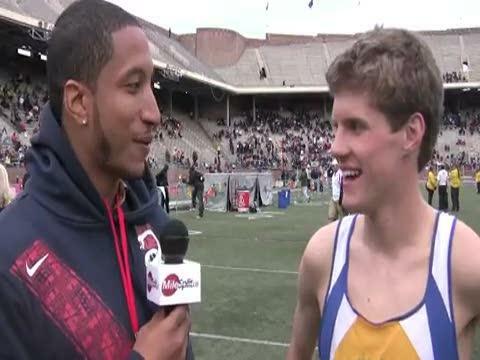 Penn Relays, Lock Haven Classic, Unionville! 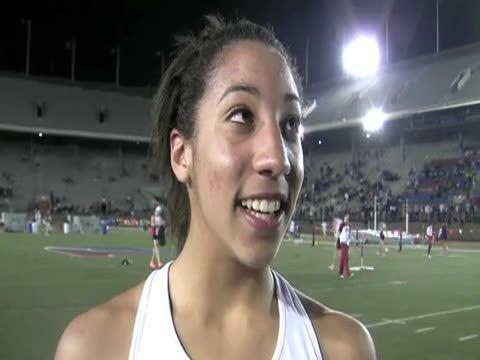 University of South Carolina sprinter LaKya Brookins talk about her final season and future. 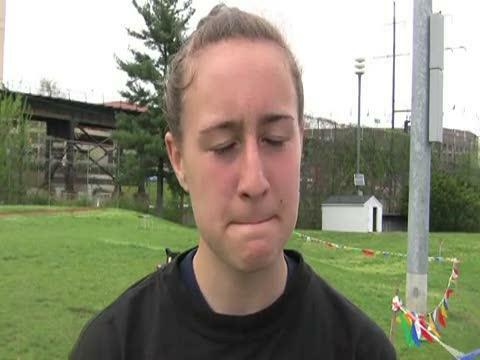 State College's Lauren Kenney talks about javelin in the state and winning the event. Benjamin Cardozo's Claudia Francis talks with ArmoryTrack's Chris Hunt. 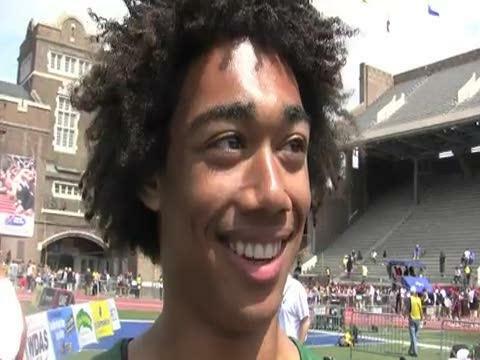 Jordan Yamoah of Arlington (N.Y.) talks about winning the pole vault with a new record of 16 feet, 6.5 inches. 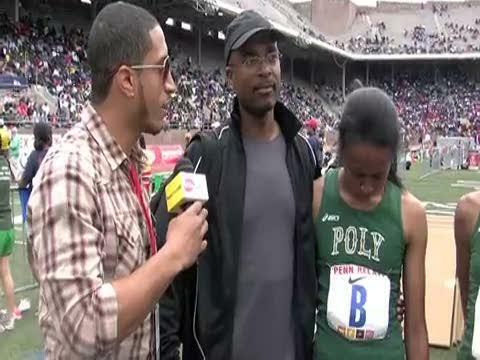 Long Beach Poly electrified the crowd by winning the 4x100 in a blazing 45.23. Morgan Pearson used an 850 meter kick to win the 3k in 8:23.34. Long Beach Poly won the boys COA 4x800 with a US#3 All-Time clocking of 7:31.69. 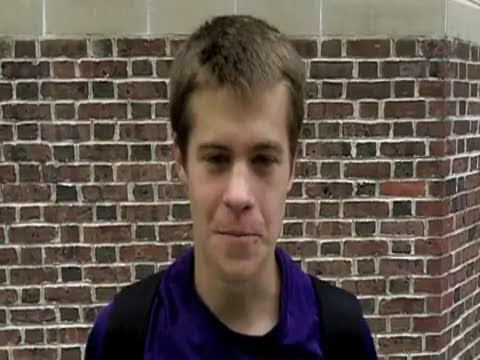 Abington senior Kyle Moran talks about Penn Relays and finishing second in 4x800-meter relay. Moran ran the anchor leg in 1:53, with a combined time of 7:37 - good for number seven all-time. Matt Jablonski used a monster kick to edge past Chad Noelle for the victory in a time of 4:10.37. Christian Brothers Mike Mazzaccaro used a swift kick with 200 meters to go to bring the gold home to NJ.